Google Scholar recently added the ability to find related articles for a paper, so I decided to try it out with a paper from my former life as a graphics person. It was a paper in SIGGRAPH a few years ago called the “Office of the Future” and it dealt with projecting images onto surfaces that aren’t exactly flat. If you predistort an image before you project it, you can often cancel out the different surfaces as you project onto them, which lets you create the appearance of a flat screen again. Here’s a picture that gives you the idea. It’s completely unrelated to me or the paper, but it demonstrates the concept really well (I just did a flickr search for [projection surface] and found a nice result–thanks flickr! I don’t read German, other than a few choice words like Private Krankenversicherung, Flugkarten, and parkplatz but it looks quite similar: someone is measuring the irregularity of the rock and then pre-distorting the projected image so that it looks flat when projected. I can attest that that’s a pretty relevant list of related articles. Isn’t this the exact thing that Larry and Sergey were attempting to do when they created Google in the first place? So… the “Cited By 300” link leads other scholars who gave a citation (Back-Links)? 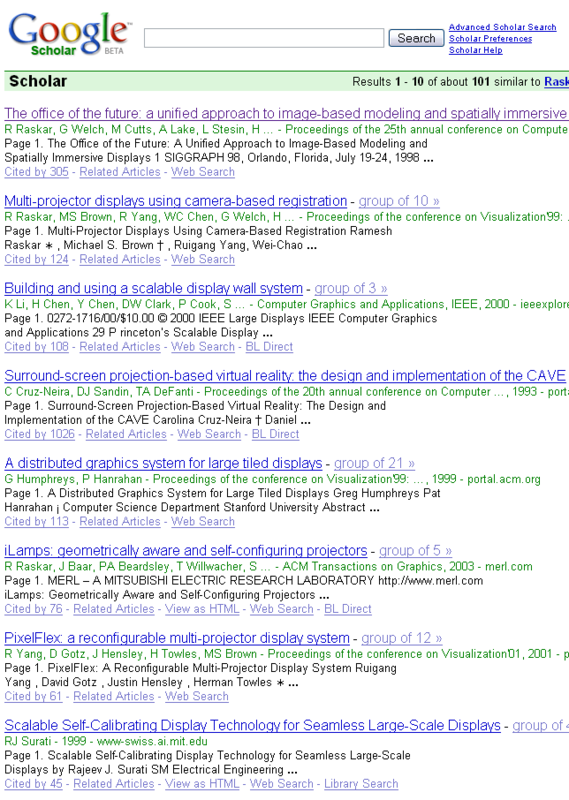 “Related Articles” share common Back-Links? If so… Why not do that for the regular Web SERPS? RE: Projection surfaces. Mount St Helens has a neat tourism display where a talking face is projected on a ranger mannequin who lectures the viewer. It’s very realistic and I’d think would have many neat applications when a 3D experience is best. Totally off topic (well kinda) I noticed that you also had an interest in bugs Matt, I am pretty sure those much smarter than me (with the funds) could learn how to hatch dragon flies as a natural mosquito deterrent to avoid dangerous pesticide spraying. There are 3 varieties of dragon flies patrolling my yard eating mosquitoes so they do not get my son at dusk, they do so efficiently and I look for information on this. Wonder if I could find this info. in scholar? My guess is that related links isn’t just co-citation (sharing common back-links), Hawaii SEO, but that’s a pretty good way to think of it. Aaron Pratt, I’m sure you could think of some military application, but on the other hand you could do that with a ton of things. 🙁 I worked on it because it was fun/cool to me. I missed SIGGRAPH this year, but a shout out to my friends from UNC and elsewhere that I didn’t get to see this year.. But why is Google now only returning results for fee-based archives. It’s pointless to promote Google Scholar to anyone outside the academic community since the material is now virtually unreachable by the majority of people on the Web. What happened to all the freely accessible scholarly material? Joseph Hunkins – Yeah that, VERY cool stuff to dream about. 🙂 Hey, your entire WordPress blog uses the nofollow tag, is that your doing or is it WordPress.com? Back to Scholar, I use it to find information on stuff from time to time and I am surely no student and also have a lot of catching up to do. Here are some common errors in english found via Scholar. This will help to write a better copy hehe, so yeah Scholar has it’s uses. Here is one found in Google Scholar for the phrase “word usage” which you guys might want to remove, looks like someone over monetized, doh! I noticed that Google Scholar is not obeying the ROBOTS NOARCHIVE meta instruction and is displaying cached versions of pages that contain this instruction even though the main Google search does not display a cached version of said pages. Kind of off-topic but I think this is quite interesting. Google states that it has eliminated the common words “of the” from the search, but all seven results that are shown have the exact text “office of the future”. Is Google not really ignoring those words after all? I am pretty successful in finding papers in other languages but yet through another method. Say I look for X from english into german. Then I look first at the X document in english, look for related general words in english. I then translate in my mind the easy related words in German and then enter the word X I want in English + the translation of the related words in german in google with “pages in german” or better”pages from germany”. I then get most of the time bilingual documents which help me to find more words in german to refine my search only in german. The problem with google.com is that you can’t find “pages in english” or “pages from the us” (it is taken that most of the time people using google.com are the surfer from the us. You then get a mixture of crap in many languages that doesn’t help). And no, I am not going to enter any refine parameter because I have enough cookies on my computer already. Next time one find bilingual search terms on their logs, one may not think that we are crazy. 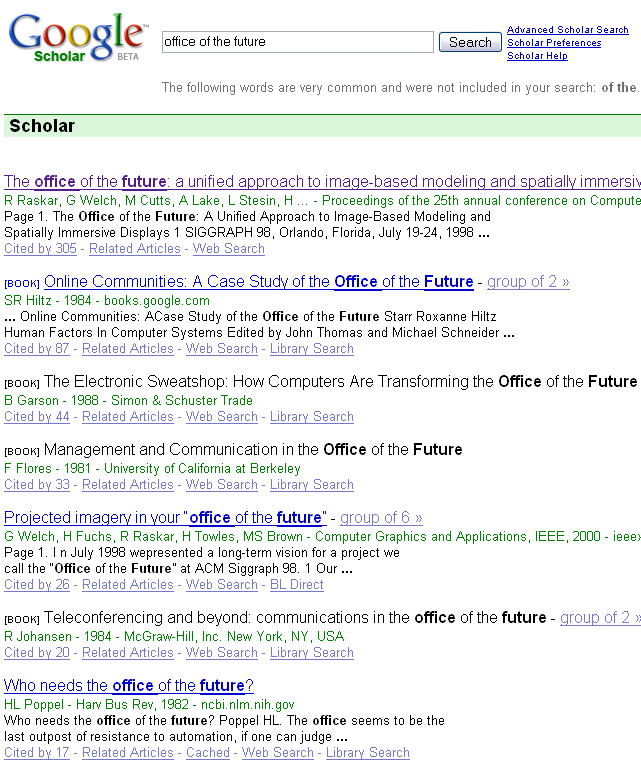 Google is the best dictionnary for me and I don’t need google scholar. Matt, assuming the Google Scholar algorithm hasn’t been modified to favor fee-based sites, is it fair to assume there may be a shift in linking patterns among the academic sites? Is there a trend toward source monetization that is being actively developed in the academic community? I suppose that’s a bit out of your venue, but it’s frustrating to look for papers through Google Scholar right now as all the results I’ve encountered lead back to the fee-based access portals. ACS tends to dominate a lot of searches. Some sort of optional weighting or filtering would be advantageous for surfers. If you are trust Google more than your Doctor! then its time to change your Doctor. Projecting graphics on unusual displays! Product of the future? Not sure! If we look at movies like The Matrix, we can all see what the future can hold. How about a projector pen!